READ AND AGREE TO COMPLY WITH ALL COMPETITION RULES BEFORE REGISTERING. Captain's Meeting: 6:30 AM Near the Main Boat Ramp In Venetian Gardens. Attendance is Mandatory. Registration Fee*: $35 per Angler. Big Bass: Will be an extra $5 if you would like to participate. Payout: 1 Place Will Payout for Every 10 Anglers. Eligibility: This event is open to all anglers fishing from kayaks, canoes or paddleboards. See Rules for details. You may reside in another state, but you must have a Utah Fishing License. You don't have to be a CFKBA Member to fish the CFKBA Bass Series. However, you will NOT be eligible for AOY points that go towards KBFNC, but you can still win prize money. Eligible Waters: The entirety of Lake Harris up to the bridge dividing it from Little Lake Harris. Registration Deadline: Will be open up until the (optional) check in at 6:00 AM. Identifier Release: You will receive your identifier at the Captain's Meeting on the day of the event. Watercraft needs to be visible in pictures. 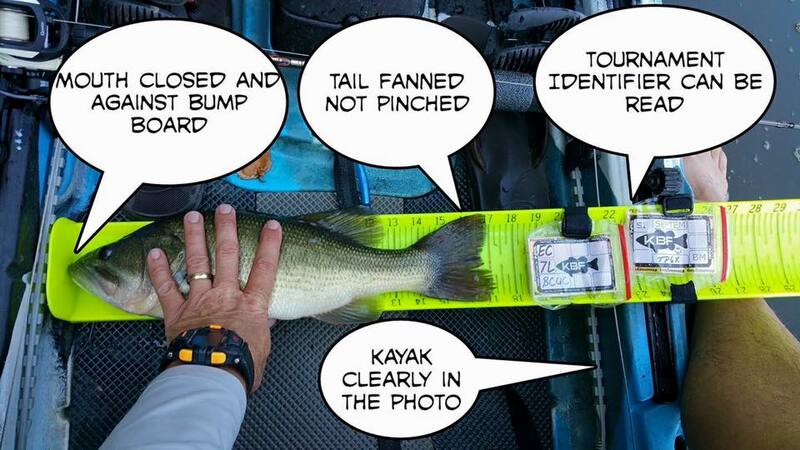 Catch, Photo, Release as per KBF Standards. Closed mouth and natural lay (no pinched tail). KBF Approved measuring device must be used. KBF Rules apply. Find them HERE. Anglers are being judged on the total length of their 5 Biggest Fish. In the event of a tie, times of pic submitted is the deciding factor. The angler will be solely responsible for uploading all submissions to TourneyX by 4:00 PM. The Tournament Director will NOT be responsible for or involved in manually uploading submissions. All prizes to be paid within 7 business days after the closing of the tournament. Cash Prize can be paid via Paypal or Money Order. ALL ANGLERS ARE TO PARTICIPATE AT THEIR OWN RISK!